Smoothing in Carrara how does it work ? today I tried a bit with the vertex modeller in carrara. Here I have a few questions come up. Firstly, how does the smoothing in Carrara work? I have tried a little, and I previously thought smoothing generates additional polygons. In Hexagon I can see these polygons and also work with it (move, select, ...). In Carrara, I see only my mesh is changing, but I have no possibility to select the generated polygons or points to move them. I have two screenshots added in order to clarify it. My second question is in another post. Same thing. It multiplies each polygon into four for each level of SubD smoothing. So it virtually Subdivides the mesh, and then applies a smoothing algorithm on the higher virtual fidelity. See the blue lines on the edges of your Carrara example? That (in this case) means that those edges are set to be creased. That is why the end caps aren't collapsing like they are in your Hex example. In Carrara, just below smoothing sliders, click Apply to make the virtual subdivision Actual, which turns smoothing off. Turn it back on for further SubD. In Carrara, I see only my mesh is changing, but I have no possibility to select the generated polygons or points to move them. True. You cannot select them directly. Only see the results as you make changes to the actual mesh. If you want the the extra polygons so that you can manipulate them individually, try the subdivide or tesselate choices under model tab of the vertex modeling room. Make sure your whole object (or whatever you want subdivided) is selected. Thanks for clarifying this, ok so in this "state" Carrara is like Hexagon before push the "Form Control Flash", don't know how to Name this ;-). I am going to go out on a limb and guess that you are an experienced modeler in hexagon and that you have reason to use Carrara for some project, or to take advantage of its non-vertex modeling capabilities. 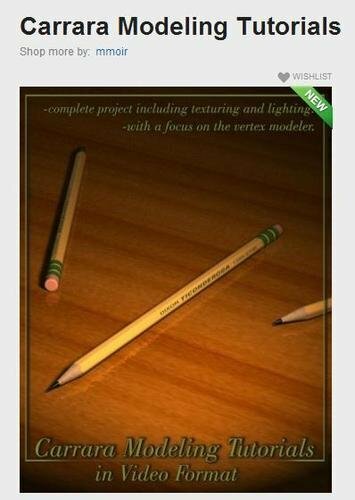 If you don't mind a commercial announcement, I highly recommend MMoir's vertex modeling tutorial. If it is in your price range, it will be the best transition-to-Carrara step you ever made. Everything you do in Carrara's vertex modeler will be faster, easier, and more accurate. Hexagon is indeed known to be not very stable, I sometimes do something with it, but only smaller projects, since it usually crashes in the worst moment. In order to make great projects I wanted to change for carrara, since this seems to me more stable. A few years ago I modeled with C4D, but with trial versions because the software simply too complex, and therefore not priced in the frame for hobbyists. Unfortunately, as far I know, there is no more trial version. In order written tutorials I do usually have a bow, as my English is not very good. In video tutorials I can still see what I do not understand;-). Thanks for the tip on the tutorial, I'll put it on the shopping list. From Carrara I promise myself of being able to eventually create a small animation, I've only rendered images. Unfortunately, my skill is what light and landscapes terms currently very low. I'm happy to achieve a picture in the quality, as can be seen in the product images.